Battle-packs have been around for a while now, almost eight years in fact and in those eight years some things have remained largely the same such as the piece count (averaging at about 83 pieces) and the number of figures included (only 7654: Droids Battle Pack and 8015: Assassin Droids Battle Pack didn't have exactly four minifigures instead having seven and five minifigures respectively), while on the other hand some things have changed such as improved design of the minifigures and the set overall, as well as a rise in price. Another thing that has changed with the battle-packs over time is the division of figures based which side they're on, for a while two sets were released each year both based on a certain peroid of time in the Star Wars universe but each focusing on one side of the opposing armies, then in 2012 the battle-packs merged sides (for example having either Clones vs. Droids or Rebels vs. The Empire in each set) and each set was based on a different time peroid and now in 2014 things have changed yet again by having battle-packs based around different points in the Star Wars timeline and by having some only contain clones or imperials while another has clones and a droid.Hopefully though the thing that will always remain the same about battle-packs is the quality since, for the most part, they have all been pretty good buy and even the worst one *cough* 8015: Assassin Droids Battle Pack *cough* being at least worth considering. As is the case with most battle-packs there really isn't much to the set besides the minifigures (which are superb but more on that in a bit), usually a little ship or speeder is provided for the figures to use which is fine but 75036: Utapau Troopers stands out as being even better than usual. At first I wasn't sure why this battle pack in particular caught my interest, the clones are nice but not any more detailed than most of the other Star Wars figures released recently but then it struck me, by having four minifigures versus a large enemy this battle-pack has done something that no other has and has ended being one of the best battle-packs released so far. Like most sets its size there are only a few interesting non-minifigure pieces in 75036: Utapau Troopers, the most notable and obvious being the medium sized sand coloured dome, which could be quite useful when building your own thing though the colour isn't the greatest. The other notable pieces are those used to make the new stud-firing blaster that was introduced in this wave of Star Wars sets. These new blaster are actually pretty neat, even though they don't look nearly as stylish or accurate as the previous blasters (even the old megaphone blasters almost look better) they make up for in functionality and these blasters are actually rather powerful given their size as they are able to knock a minifigure over and back quite a bit. The four minifigures included are two Clone Paratroopers and two 212 Clone Troopers. Even for licensed minifigures based on characters from a live-action film these minifigures are detailed with a truly incredible attention to detail with pouches and scuff marks to add to the battle hardened trooper look and since this is a battle-pack they are the main draw for purchasing this set. The clone paratrooper's helmet is very nice and much rounder than that of the standard clone trooper, resembling an upside down bucket with a oversized lip. The helmet has a black long, thin viewfinder going across the middle with two slanted orange lines coming out the upper side, a small black mark below to show the nose ridge and scuff marks above and below the viewfinder. The helmet breather is vertical down the middle half with orange marks on each side of it at the bottom and two vents on the left and right sides of the bottom. The front torso is printed with the standard clone trooper armour overlaid with various details and orange highlights on the belt pouches. The upper left side of the troopers chestplate is just printed with two downward-slanted orange lines while the right side of the chestplate has a black, with orange highlight, shoulder/chest-pad of some sort with two light grey straps going down from it to the two main pouches on the belt at the bottom. A medium tan ammo strap also goes down from the top right to the bottom left. The trooper's left arm is plain white while the right arm is orange. The legs are white but have some very nice printing to show the armour ridges and kneeplate with the left kneeplate being orange with two slanted orange lines above it. The back of the helmet is plain white but is mould with two vertical ridges going down the center and starting from the middle. The back torso also has the standard clone printing but with a continuation of the tan ammo strap and a light grey strap going up to the little bit of shoulder pad on the trooper's right. The back of the legs have no printing but are covered by a clone armour skirt seen previously in another battle-pack (9488) but this time coloured in medium stone-grey. 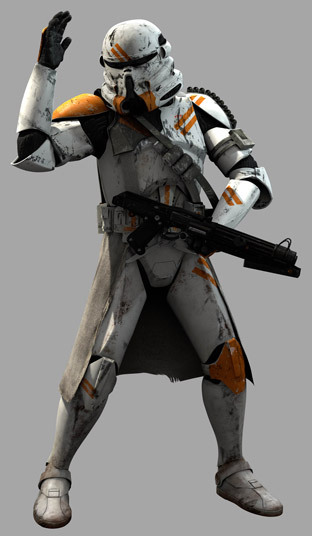 The 212 Clone Trooper is essentially just a standard clone trooper with added orange markings and scuff marks. The clone is the same as the version included in the Clone Turbo Tank microfighter but the print is a bit different in some places. The helmet is the same as all post-2013 phase 2, except with an orange chevron at the top and some scuff marks, looking very much like the end of a tube and sitting high on the minifigure's head. The face of the helmet is printed with the classic clone T-viewfinder and a detailed mouth grille in the center with shading on the sides. The front torso is again printed with the standard clone trooper armour overlaid with an orange chevron a the top center and mid-sides and more highlights on the belt, both the arms are orange. The legs are both white with a chevron across the top of both and like the clone paratrooper's they have print showimg the ridges in the armour along with kneepads which have a bit of orange on the inner edge. The back of the helmet and legs are plain white but the torso has a bit of orange detail on the armour print showing a continuation of the side chevrons from the front. For a set at the lowest price point available in the Star Wars theme (CA $15.99/ £11.99 / US $12.99) 75036: Utapau Troopers has a high playability factor especially when compared to sets like 75034: Death Star Troopers. Even though the flick-fires are in an awkward position the addition of an enemy Tri-Droid instead of a vehicle or something for the clones means that one could play with this without need for any additional sets. Though it's a small 76002: Superman: Metroplis Showdown is nonetheless a solid set that has pretty good potential to become a worthwhile investment in the future. This set as a whole is great but as a collector the Clone Paratrooper is one of the best parts about it and really makes this worth getting. If you're looking to buy this set as an investor you could open it and sell the figures and droid separately or keep it MISB and wait a few years, either way it looks like this set is in a good position investment-wise. Even though this set is only a few months old the individual minifigures are worth enough to warrant purchasing and selling separately but they may also experience some fluctuation in value. When parted out on average the four figures have sold for a total of CA $13.40, US $15.44, GBP 11.76 with each average resting just above or just below the MSRP for the set as a whole. Already that's a superb return for your money if you plan on parting this set out you still get quite a bit back and of course it's always a good idea to look for a sale which would greatly boost the return here. Star Wars has always been a powerhouse of a theme, even with the gradual decline in popularity (save for UCS models and some of the other large sets) among AFOLs one can be fairly safe when investing in most Star Wars sets based on any of live action films, though sets from the prequels don't always do so well when compared to those from the original trilogy. 75036: Utapau Troopers is available for all retailers to sell an therefore isn't an exclusive. The box is pretty standard size and shape for a set at this price point CA $15.99 (£11.99 / US$12.99 / €14.99) and shows the clones fighting the Tri-Droid. By taking a look at the Brickset ratings and Bricklink prices of this along with the other sets at the CA $15.99 price point in the Star Wars theme one can gain an understanding of how 75036: Utapau Troopers may appreciate and also how it'll do in comparison to the other sets in its price bracket. Again it's important to note that since this set is only a few months old it still might not be available to everyone and therefore the secondary market price may be a bit inflated at the time of this review. Even though it's a small set the clones and Tri-Droid can be set up for a nice fight scene, but on its own the droid is underwhelming. Most battle-packs are made to be paired with other sets or battle-packs for opposings sides but as mentioned before this battle-pack is especially good because it includes mutiple minifigures from the same army but also provided an enemy for them to fight. But another thing that 75036: Utapau Troopers made me think of is how sorely the Star wars theme is missing sets like this, that is small sets where mutiple figures face off against a larger enemy or, like in the case of a sets such as 75037: Battle on Saleucami, versus a vehicle. Of course battle-packs are great but it's nice to be able to buy one small set and have a non minifigure vs. minifigure fight, instead of a set for each opposing army as was the case for most battle-pack releases. What I'm saying is that this set is a great example of the variety that has been missing from the battle-packs but that also seems to recently be absent from the Star Wars theme as a whole. This set reminds me of when I was a child and I only had a small amount of my own money (something I'm sure many others remember), aside from Christmas' and Birthdays the only sets I was able to buy were about five or ten dollars. Since I was just a kid my judgement was much less discerning and besides that I didn't have access to consumer reviews of sets, so most sets I bought were only ok and some were duds, but every once in a while I'd stumble upon a great set that I'd play with for hours and come to throughly enjoy. 75036: Utapau Troopers is one of those standout sets.